Jacques Nutan was born in Belgium, the son of two teachers. A consummate artist always, from his early teens he was close to local artist, writer and Art Publisher Andre Blavier. Through him he associated with most of the Belgian and French Dadaist and Surrealists Painters and Writers, including Rene Magritte, Raymond Queneau, Paul Scuttenaire, Jean Queval. These greatly influenced him at an early age, and he went on to study first painting, and then Photography at art college. This saw him travelling widely, and on one early Irish assignment in 1969, he landed on a Dutch fishing boat in Killybegs, fell in love with Ireland, the light and the pace of its life, and returned to live there in the early 1970s, in a variety of places. He was naturalized as an Irish citizen in 1978, and settled in Kinvarra in 1992. He spent two years in Brussels as a stringer for The Irish Times, The Sunday Tribune and the French Photographic agency Gamma. He has worked as a Lecturer in the National College of Art and Design in Dublin, The Sligo Art School, The Waterford Art School, G.M.I.T and has given many photographic workshops. His work and assignments have taken him all over the world, during which period he spent five years following Sean Kelly and Stephen Roche on all the continental cycling races, working for French and American Press Agencies. Although he continued painting throughout his life, the reputation he has established has been in photographic journalism. He has published many books and worked for most of the world’s major photo orientated magazines (Paris Match, Geo. Time, Stern, etc.). He is a member of RAPHO, the exclusive Parisian Photographer’s agency. He spends considerable time digitizing and archiving his life’s work, and takes commissions for varied projects. His most recent book is launched in April, 2016, a collection of black and white images of Ireland in the end of the 1960s. 1964- 1966 – Studied painting and awarded Graduate degree at the Academy des Beaux Arts de Verviers, Belgium. 1966-1969 – Studied photography and awarded BA at Institut St- Luc in Liége, Belgium. 2005-2006 – Ran photographic and digital workshops for Castlerea prison. 2004 – Ran photographic workshops for professional Portuguese Photographers 2003 – organized and ran workshops on the West Coast of Ireland for American Photographers. 2000-1998 – Photographic Lecturer, GMIT, Galway. 1977- 1980 – Lecturer in Photography, Sligo Art College. 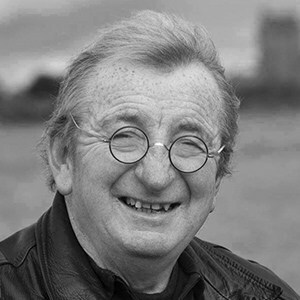 1980-1978 – Lecturer in Photography, National College of Art and Design, Dublin. The Sunday Times, Newsweek, Time Magazine, Stern, Airone, National Geographic, Geo, Zeite Magazine, The Figaro Magazine, The London Independent Magazine, The Observer Magazine, The New York Times, Armen, Le Chasse Marée, Country Living. 2016: Irlande 66/69 – Images of Ireland in the late 1960s. Bruxelles: Yellow Now – Les Carnets. 2011, 2010, 2006 – Places of Irish Architectural Interest. OPW, Dublin. 2006 – The Islands of Ireland, Thames and Hudson, London . 2006 – Iles d’Irlande, Editions Hoebeke, Paris. 2003 – L’Eternel Irlandais, editions du Chêne, Paris. 2002 – La Chevauchée des Kids, editions Hoebeke , Paris. 2000 – The Irish to-day, Cadogan, Dublin & New York. 2000, 1999, 1998 – Ireland, a Photographic journey, Graphique de France, Boston, USA, and Paris, France. 1998 – The Blooming Meadows, the world of Irish Traditional musicians, Town House and Country House, Dublin. 1987 – Une Saison 4 Etoiles, Winning Productions, Bruxelles, London & New York. 1985 – The Great Races, Edition Winning Productions, Bruxelles, London, New York. 1979 – La Bretagne, Editions Artis Historia, Bruxelles and Paris. 2004 – Biarritz, festival de l’Image, silver medal for “the most beautiful photographic book of the year” ,(L’Eternel Irlandais). 1997 &1994: Eircel, P.P.A.I Awards Winner, People category. 1990 – Winner, Benson and Hedges Gold Awards, London. 1969 – Pentax Gold Award, Bruxelles. 2009 06/07 – Rapho Photographers, festival de l’image. Arles, France. 2009 01 – Rough Cuts and Notes, The Gallery of Photography, Dublin. 2008 06 – The Best of Rapho, Perpignan, agence Rapho, Festival de la Photo. 2005 03 – L’Eternel Irlandais, Centre de la Vallée, Paris, France. 2004 04 – Animals” , group show, Russel Gallery, Ballyvaughan. 2003 03 – L’Irlande de Nutan. Athys Mons, Belgium. 2000/2001 – Blooming Meadows, Milwaukee, Wisconsin, USA. 1999 07 – Blooming Meadows, the Library, Drumshanbo. 1999, 1998, 1997, 1996, 1995 – Force 10 Group shows, Sligo, Dublin and Leitrim. 1999 03 – Blooming Meadows, St Patrick’s day Festival, Saint- Savinne, France. 1997 07 – The Traditionals, Willie Clancy Summer School, Miltown Malbay. 1996 07/08 – The Traditionals, Galway Arts Festival, Town Hall Theatre,. 1996 – The Traditionals, Temple Bar Music Centre, Dublin. 1973 – Art Photographers of Belgium, Knokke, Belgium. 1979 – Art Photographers of Belgium, Musée des beaux Arts, Bruxelles, Belgium. 1969 – The Living Theatre, Galerie de L’Etuve, Liége, and Galerie de L’escale, Verviers, Belgium. 1968 – Images in Black and White, Musée des Beaux Arts de Verviers. 2006, 2005 – Cill Riallaigh Art Gallery, Ballinskelligs, Co. Kerry. 2005,2004,2003,2002 – Gallery’s Artists, Kenny’s Art Gallery, Galway. 2004, 2003 – Boyle Arts Festival. 1998, 1997, 1996, 1995 – Force 10 group exhibition, Sligo. 2009 – Rough Cuts and Notes. Feakle Festival. 2002 – Carrots” Galerie du Rivoli, Paris. 2000 – Irish Bogs and Aerial Landscapes”, Gallerie du Dauphin, Liege, Belgium. 1998 – Blooming Meadows” Drumshanbo county Library. 1998 – Blooming Meadows”, Model Art Gallery, Sligo. 1968 – Oil Paintings of my home town”, Escale Gallery, Verviers, Belgium. Guinness Peat Aviation. Shannon and Dublin. Cill Riallaigh trust, Ballinskelligs, Co. Kerry and Harcourt street, Dublin.